While the adoption figures are stunning by every measure—the cell phone is the most quickly adopted consumer technology in the history of the world— there are some demographic groups whose embrace of the cell phone is somewhat less avid than others. Those groups are: people ages 65 and older; those who did not attend college; those living in households earning less than $30,000; and those in rural areas. In this survey, it is even the case that women are statistically significantly less likely to own cell phones than men—though this pattern has not been evident in all of our previous surveys. Pew Internet reported yesterday that a big part of the cell adoption story is the rise of the smartphone. 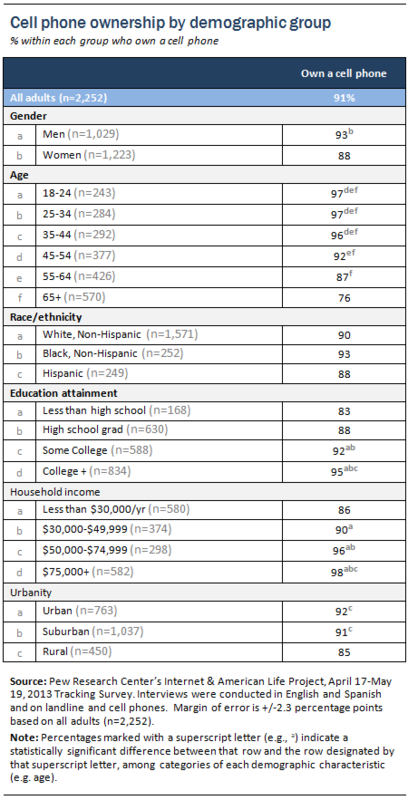 In this same survey, we found that 56% of American adults have smartphones. Our fall survey of youth ages 12-17 put their cell phone adoption at 78% (and 37% of all teens have a smartphone). Non-owners were younger teens (especially boys), Hispanics, and those living in poorer households. The Pew Research Center began asking separately about cell phone ownership in late 2004 and began to ask about the special ways people might be using their phones in March 2006. At the time, it was clear that texting was becoming popular (35% of cell owners were texters then). Moreover, it was evident that people were using their cell phones under different circumstances and for different purposes than the way they used their landline phones. In that early research we uncovered a lot of the tensions that mobile connectivity has introduced to modern life: We found that 74% of cell owners had used the phone to get help in an emergency and that 86% of cell owners were irritated at least occasionally by loud cell users in public places. In our early work we saw that 41% of cell owners said they were beginning to use their phones to fill in free time with phone calls while they were traveling or waiting for something. Some 28% of cell owners at that time admitted that they didn’t drive as safely as they should. And 22% reported that “too many” people were trying to get in touch with them. Since then, phone ownership has risen sharply. Our best compilation of the pluses and minuses of cell ownership came in this report, which showed that many constantly check their phones; keep them by their bedside; think their phones make life better because they connect with pals more often; think their phones make life easier to plan; and think their phones make them more productive. Cell phones have become integral to key activities, such as people getting health information and using them for political and civic purposes. Two-screen “connected TV viewers” are on the rise. More and more people use their phones while they shop to compare prices and read reviews. Some connect to libraries via cells. The most recent rundown of how cell phones have become the Swiss Army Knife of communication and all the activities they perform on their devices is here. 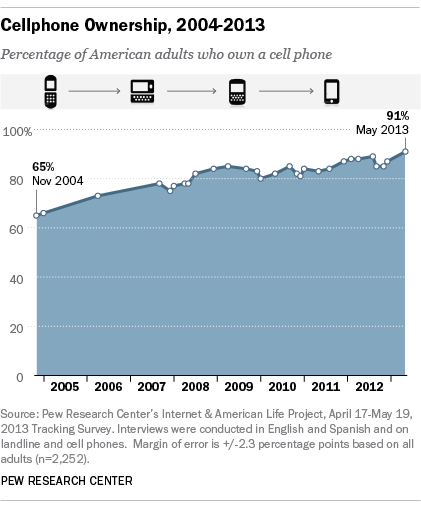 Of course, the world of Pew Research has been directly affected by the rise of cell phones. We need to connect to cell owners as we do our surveys. As of June 2012, 35.8% of American homes have become cell only and another 15.9% of people receive all or almost all their calls wirelessly, even though they still have landlines. So, most of the time in our national surveys we conduct 50% of our phone interviews on cell phones and that has greatly helped reach younger adults, African-Americans, Hispanics, and those in poorer households. And that has helped us maintain our capacity to get nationally representative samples. At Pew Internet, we recently added a question about mobile internet connectivity to our core questions identifying who uses the internet. Last year, we found that 17% of cell owners do most of their browsing on their phone, rather than a computer and we noted that 25% of teens fall into that category. We’ll be updating that figure for adults in a few weeks.